January 7th, in Saint-Aubin-les-Marais. Albert Retailleau is crushed by a train. Accident or Murder? Fingers are pointed to Etienne Naud who, trying to conceal the scandal, asks for advice from his brother-in-law, a Parisian judge. The judge requests his friend Maigret to go on the spot and to help Naud. In Saint-Aubin, Maigret, who is not on an official assignment, is not at ease. The Naud family hardly appears to appreciate his presence. The inhabitants of the village keep silent and disapprove of the intervention of this police chief who seems to protect high society, represented by the Nauds. Moreover, the Parisian private detective Cavre, a dismissed police officer, nicknamed inspector Cadavre(2) arrives in the village. What kind of role plays Alban Groult-Cotelle, friend of the Nauds, who hastens to provide Maigret with an alibi for the night of the "accident"? The only solid evidence is the confidence made to the police chief by Genevieve Naud: her parents are unaware that Retailleau was her lover and that she is pregnant. Little by little, some villagers realize that Maigret seeks the truth before all. They speak and if others keep silent, it is because their silence was bought. The police chief learns that Retailleau Genevieve 's lover, but that he was planning to leave her. He was determined to tell her the evening of the "accident". Maigret intercepts a compromising telephone call made by Naud to his brother-in-law, the judge, in which he insists on calling Maigret back. He also gets to know Groult-Cotelle a little better. He turns out to be a muggy and vicious creature. 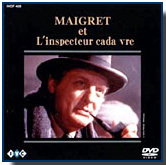 du juge Finally, confronted with the information accumulated by Maigret, Naud breaks down and confesses that he caught Retailleau, leaving his daughter's room, followed him, killed him and simulated an accident. 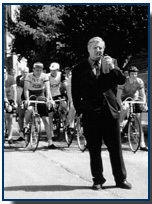 He only informed his wife and Groult-Cotelle. He had been the one to invite the private detective, unaware that his brother-in-law was going to send Maigret. But Naud doesn't know the full truth. For Maigret, the true perpetrator is Groult-Cotelle. It's him who allured Genevieve, made her pregnant and pushed her in Retailleau's arms, trying to endorse paternity on the young man. This way he could continue his commodious life as a friend of the family and secret lover of the young girl. But he didn't count with Retailleau who understood the operation and was planning to break up with Geneviève on the evening of the crime. Saint-Aubin is situated by the author in the department of the Vendée, a very well known region to him. Simenon and his family lived there for many years, mainly during the second world war. 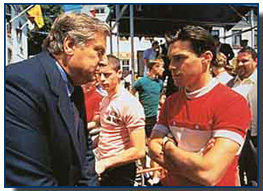 From 1940 on he consecutively lived in Vouvant (Ferme du Pont-Neuf), Fontenay-le-Comte (Ave. Victor Hugo, Château de Terre-Neuve), La-Faute-sur-Mer (Villa Les Peupliers) and Saint-Mesmin-le-Vieux (Julien Tocquerau's country house). See map on the left. 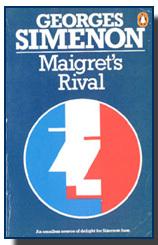 - Cover of Georges Simenon, "Maigret' Rival", Penguin Books, 1985. From: S.Trussel's Simenon's Maigret website. 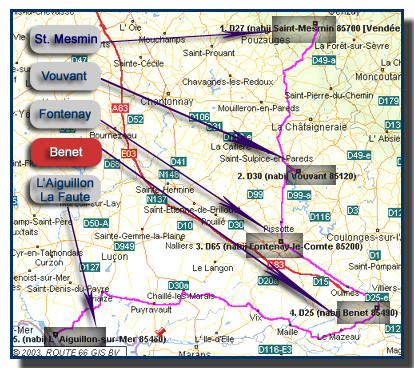 - Map by:Route 66, Route Europa 2000, Copyright Route 66 Geographic Information Systems B.V., Ede (NL). Adaptation by G. De Croock . Photos from: 1&2: www.ivc-tokyo.co.jp/details/ IVCF-439.html. 3: http://www.cfwb.be/av/KIOSK/HTM/films/fmaigcad.htm Website of the "Communauté française de Belgique". (1) According to Maurice Piron in L'Univers de Simenon, Presses de la Cité, Paris, 1983, p.300. 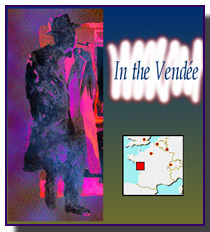 this novel is dated in Fontenay-le-Comte in 1941, based on "Simenon, Oeuvres complètes, direction: Gilbert Sigaux, Editions Rencontre, Lausanne, 1967-1973. However in the "Tableau synoptique d'après les dates de redaction" on p.473 it is mentioned that Claude Menguy situates this work in 1943. After his research C.Menguy is convinced that some dates are inaccurate and that some of the novels were anti-dated. (2) Cadavre (Fr.) = dead body, corps . (3) L'Univers de Simenon, Guides des romans et Nouvelles (1931-1972) de Georges Simenon, Sur la direction de Maurice Piron avec la collaboration de Michel Lemoine, Page 301. Presses de la Cité, Paris, 1983.